No man is an island. Yet many individuals in society, especially the elderly, often find themselves isolated due to various reasons. But Madam Rukumani Subramaniam is doing her part to change that. 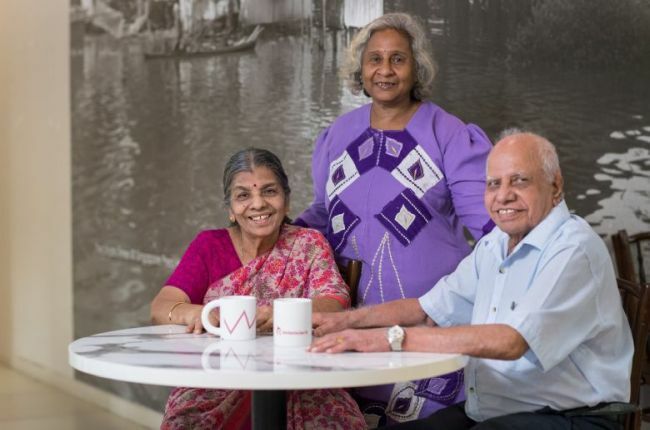 Under the Community Befriending Programme (CBP), an initiative connecting befrienders with socially isolated seniors, the 65-year-old volunteer goes the extra mile to build relationships with these individuals and reintegrate them into the community through social outings and other activities. “Coming into contact with these different people gives me insight into their lives, their struggles and what they are going through. This is very meaningful for me, and I am glad that I am able to help them,” she says. Madam Rukumani has befriended six residents since joining the programme six years ago. She volunteers with the THK Social Services @ Bukit Batok East under Thye Hua Kwan Moral Charities (THKMC). The THK centre regularly hosts activities and games for the community that it serves, such as qigong, handicraft sessions and karaoke sessions on weekdays. Madam Rukumani currently befriends a couple, the Padmanabhans (88 and 83 respectively). Although they live with their daughter and grandson, their daughter — who is a teacher — often works late and is unable to spend much time with them. In 2017, Mr Govindan Nair Padmanabhan went for a knee operation and had to make multiple trips to the hospital. His wife was his primary caregiver, but it took a toll on her. Thankfully, Madam Rukumani was on hand to provide support for the couple during this difficult time. She made regular appointments to meet them in their home, checking that everything was in order and that Mr Padmanabhan was taking his medication. “They were very friendly and welcoming, and always made time for me even though Mr Padmanabhan was sick,” she says. Since then, she has accompanied them on an excursion to Singapore Zoo last July, along with other CBP participants, and has joined them in various games and events hosted at the THK centre. These activities were avenues for the couple to meet others in the community. Mr Padmanabhan has greatly enjoyed making new friends through the programme. In the past, he and his wife would mostly spend their days on their own. Now, they are familiar faces in their neighbourhood. “When we see people outside, in the supermarket or on the street, they greet us. It makes us happy to know so many people — it is much better than sitting at home alone!” says Mr Padmanabhan. Madam Rukumani is glad that she is a befriender, and encourages others to follow suit. “I enjoy being a volunteer. Many people just need someone to talk to, and it is good to see what I can do for them,” she says. The CBP is run by 17 community organisations all across Singapore. These include Fei Yue Community Services, Presbyterian Community Services, St Hilda’s Community Services Centre and Thye Hua Kwan Moral Charities. To be a befriender, sign up at www.moh.gov.sg/befriendasenior, or call the Singapore Silver Line at 1800-650-6060, Monday to Friday (8.30am to 8.30pm) and Saturday (8.30am to 4pm). It is not operational on public holidays.